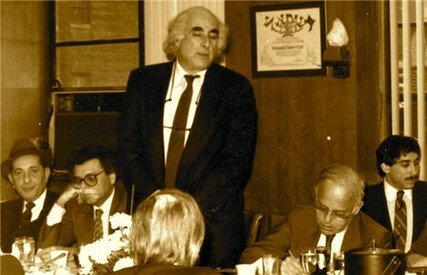 Former DDC president, William Goldberg, at a Club meeting. According to New York legend, the original impetus for starting the Diamond Dealers Club came after a stone was dropped and apparently lost, when two diamond dealers were examining it on the street. Later that evening, when one of those merchants was hanging up his trousers at home, the missing diamond stone fell from a pants cuff. At that point, it is told, he concluded that American diamond dealers should follow the initiative of their European colleagues and organize a secure facility in which to conduct business. The year was 1931, and the U.S. economy was mired in the Great Depression. But, despite the unfavorable conditions, a group of intrepid diamond dealers gathered together in an office in lower Manhattan, where at the time New York’s diamond business was centered. By the meeting’s end, a formal decision had been made to incorporate the Diamond Dealers Club. Two lawyers, Harry Sigman and Al Lubin, together with Philip Horowitz, started the Club with an initial investment of $50. But at that first meeting 12 members joined the fledgling organization. Lubin drew up the incorporation papers, which declared the Club’s aim to foster the interests of diamond dealers in the City of New York, to reform abuses, to promote enlarged and friendly commerce among members, to cooperate in creating better social and economic conditions for members; to develop higher business standards, and to eliminate unfair trade practices. The mission still rings true today. By the end of 1931 the DDC had 53 members, and growth throughout the 1930s was steady but modest. Its main role was as an association for smaller firms and individual dealers. Offices were established on Nassau Street in lower Manhattan. It was after World War II that the diamond industry really took off in New York. In the wake of the devastation in Europe, many diamond dealers immigrated to the United States, thus expanding the DDC's membership rolls. Their influx into America, together with the unprecedented economic boom that took place in the country in the post-war period, shifted the balance of the diamond trade from Western Europe to New York. Indeed, immigration has long been a decisive factor in the growth of the U.S. diamond sector, and the DDC both then and today traditionally has served as a melting pot for a diverse group of nationalities and cultures. With the dramatic rise in membership, larger premises were required and the DDC moved uptown to 47th Street. It was the driving force that resulted in establishment of New York’s iconic Diamond District, which became the hub for the diamond and jewelry business in the city as well as the rest of the United States. This included the entire channel of the business ranging from the import of rough diamonds to the production of polished diamonds; from the manufacturing of fine jewelry to its distribution to both retailers and consumers. Over the years the Diamond Dealers Club has changed dramatically to keep pace with expanding foreign markets and rapid technological advancements. It organized selling trips for members to Asia, installed highly sophisticated communications and security systems, and provided a vast array of services necessary for members of the industry to participate and compete in the contemporary world market. In 1983, Eli Izhakoff, the Secretary of the Diamond Dealers Club and Chairman of its Building Committee, negotiated a lease for space at 580 Fifth Avenue. Shortly, thereafter, the Club moved its offices and trading platform to that address, where it has been located for nearly 30 years. 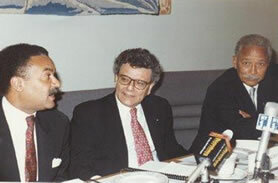 In 1990, Mr. Izhakoff was elected President of the Diamond Dealers Club and later became President of the World Federation of Diamond Bourses and the World Diamond Council. was created in 1947. It hosted the WFDB’s biennial congresses in 1964, 1982, and 2004. With the advent of the Internet, the DDC began the process of adapting its operation to an online environment. In 2003 it launched its website at www.nyddc.com. In 2003, the DDC became the first official diamond exchange to launch a fully functional online diamond trading floor. Members of the DDC know that they are protected by the Clubs stringent membership requirements, by-laws, and a proven system of arbitration, in which disagreements can be promptly resolved by a neutral dispute resolution mechanism whose decisions are upheld by the New York State Supreme Court. Since its founding in 1931, the DDC has grown into the largest diamond trade organization in the United States and one of leading diamond exchanges in the world. And although none of the few pioneers who were among its founders are alive today, many of their descendants are still prominent in the trade and can be counted among the Club’s 2,000 members. They undoubtedly would have been proud at what has been achieved.